Pope Gregory XIII granted Portugal in 1580 exclusive rights to maritime trade east of the Red Sea to as far as seventeen degrees east of the Moluccas (in today’s eastern Indonesia). 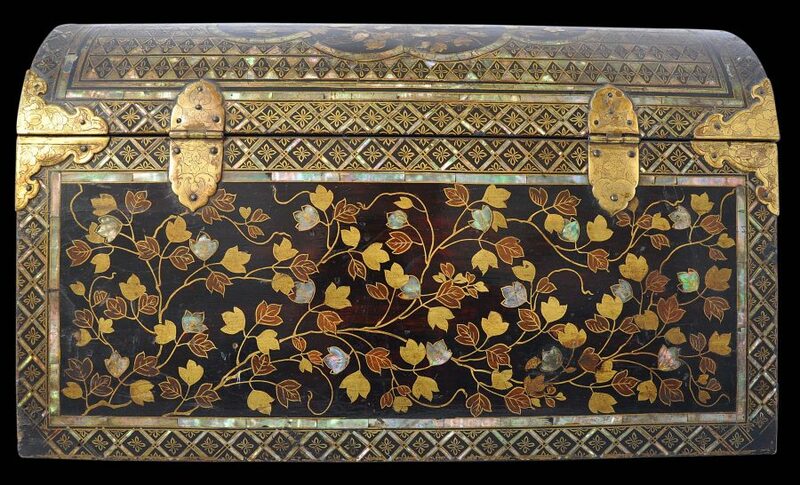 Japan thus became one of the new sources for exotic luxury goods that could be imported to Europe for profit. Lacquered chests and other objects inlaid with mother-of-pearl were acquired by the Portuguese from Gujarat in India but the superiority of Japanese mother-of-pearl inlaid lacquer was quickly noticed and so Japan became a new source to feed European demand. The coffers and other objects were lacquered in black (urushi), decorated with gold and silver dust (maki-e) and then inlaid with pearl shell (raden). The items became known in Japan asnamban, literally ‘southern barbarian’ but perhaps more appropriately translated as ‘exotic’, and was a reference to the Portuguese who commissioned the goods. The growth in the Portugal-Japan trade was remarkable for it was only in 1542 or 1543 that the first Europeans visited Japan – three Portuguese sailors landed at Tanegashima after the Chinese junk in which they were sailing apparently was blown off course. The Jesuit missionary Francis Xavier arrived in 1549. The Jesuits made big, early inroads and were particularly successful at propagating Christianity in the south. 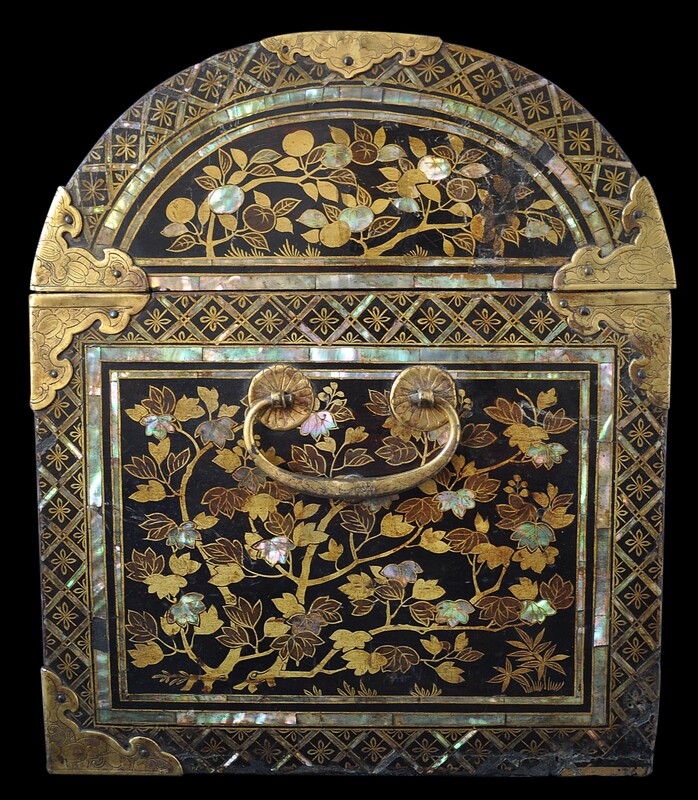 It is likely that the first Namban lacquewares made for the Portuguese were in fact made for the Jesuits. 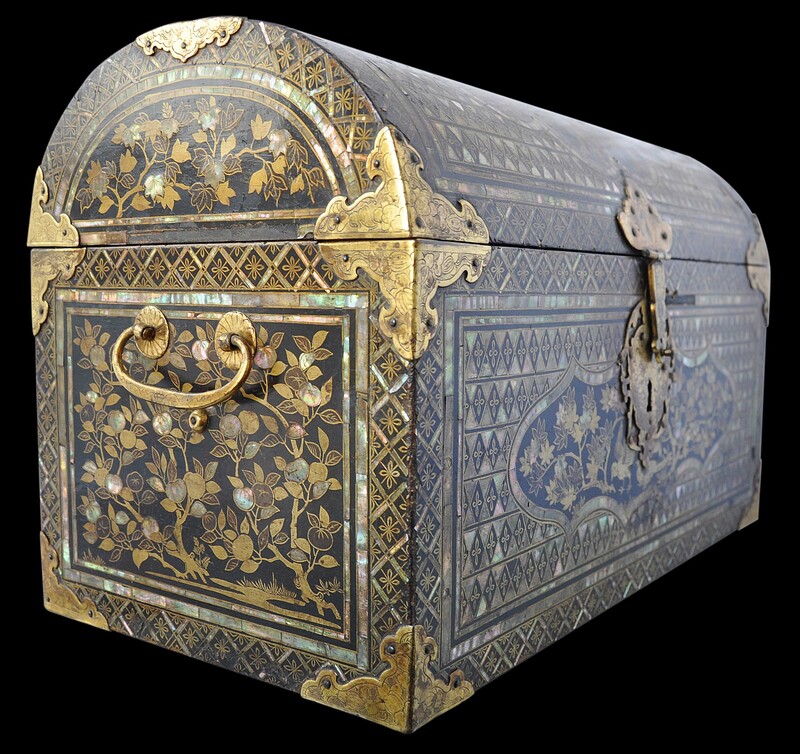 The coffer here is larger than many extant examples. 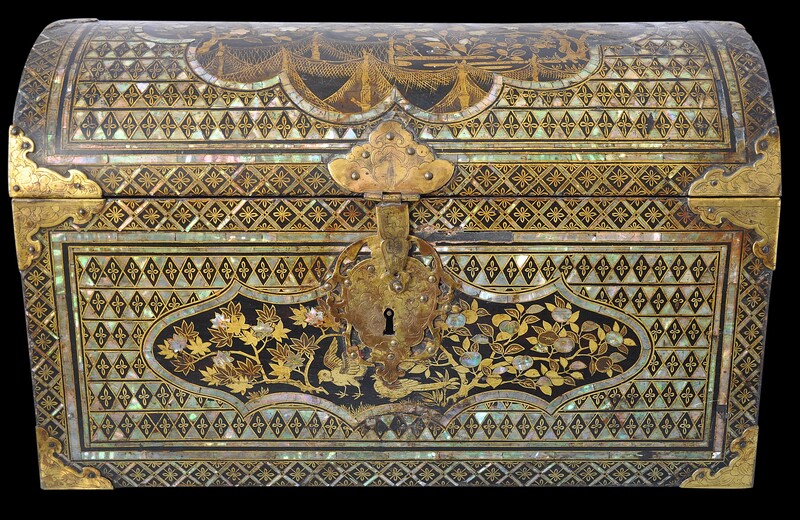 The high, rounded top, sides, front and back are decorated with gold and silver foliage interspersed with pearl shell against a black urushi background. The front is decorated with birds amid chrysanthemums in bloom and persimmon trees in fruit, all within a scalloped cartouche. The domed cover is decorated with a large scalloped cartouche marked out by a border of pearl shell and decorated with tall stands of camellias in bloom. In the foreground are numerous bamboo posts over which fishing nets have been hung to dry. 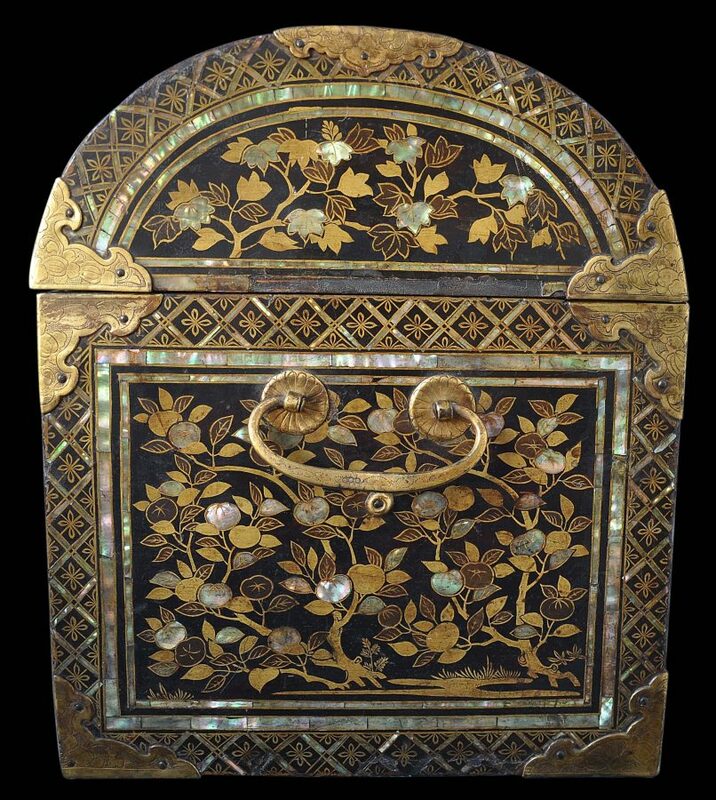 A gilt metal handle is attached to each side, and each external corner is fitted with gilded copper mounts engraved with foliage and Japanese melon motifs. All the mounts are present other than two on the back of the coffer at the base. Given their location, this minor loss is not readily noticeable. A prominent escutcheon key plate is affixed to the front. 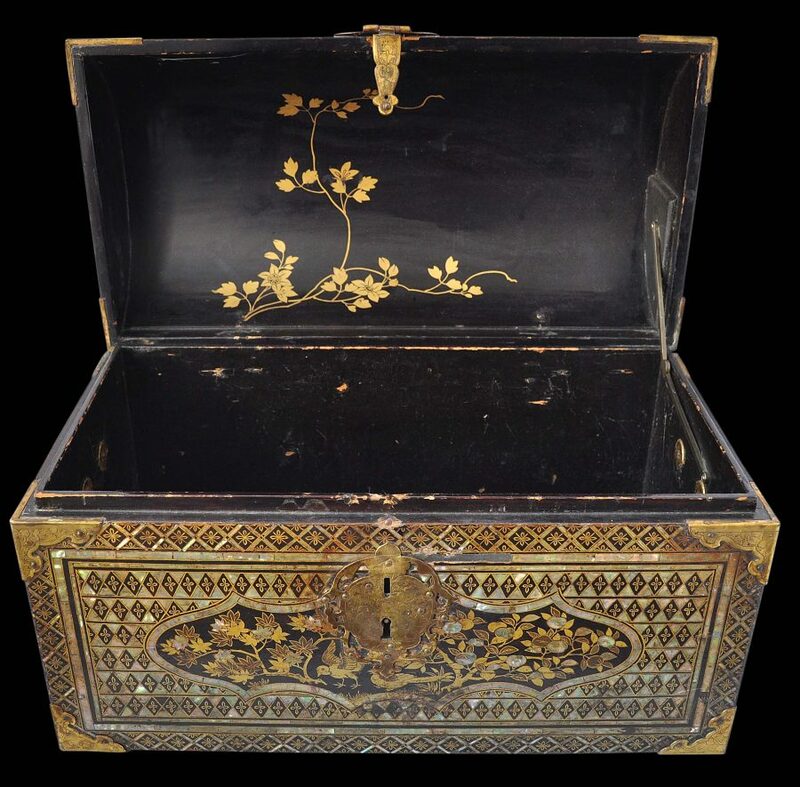 The interior is coated with black urushi and the inside of the lid is further decorated with a branch of plum blossoms in flower. 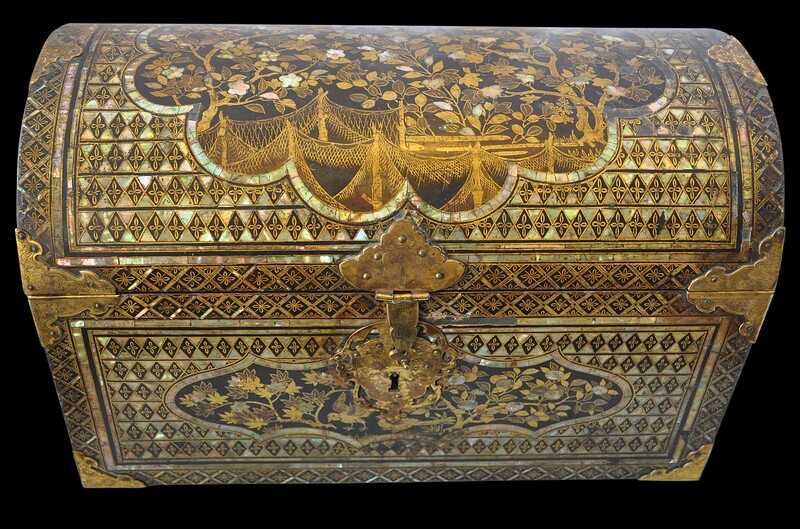 The lacquerwork is stable and remarkably fresh and bright given the coffer’s age – and yet importantly there is no evident restoration work. As can be expected, there are minor losses to the pearl shell inlay here and there. Similar examples are in the collections of the Ashmolean Museum, Oxford; the Monastery of las Descalzas Reales, Madrid; the Naprstek Museum, Prague; and the Itsuo Museum of Art, Osaka. Bennett, J., & A. Reigle Newland, The Golden Journey: Japanese Art from Australian Collections, Art Gallery of South Australia, 2009. Cattaneo, A., et al, Portugal and the World: In the 16th and 17th Centuries, Museu Nacional de Arte Antiga, Lisbon, 2009. Christie’s London, ‘Important Jesuit Lacquers and Japanese Works of Art from the Age of Western Influence’, November 19, 1985. Clode Sousa, F., et al, Obras de Referencia dos Museum da Madeira, Instituto dos Museus e da Conservacao, 2009. Flores, J.M. et al, Os Constructores do Oriente Portugues, Comissao Nacional para as Comemoracoes dos Descobrimentos Portugueses, 1998. Impey, O., & C. Jorg, Japanese Export Lacquer 1580-1850, Hotei Publishing, 2005. Kawamura, Y., ‘Reflection on Namban lacquers in Spain: collection and use’, Arts of Asia, March-April 2009. Museum of Christian Art, Rachol, Goa, 1993. Tilley, W.H., ‘Treasures from the Christian century’,Arts of Asia, September-October 1986.